Gold Coast celebrates its last-gasp win over Carlton. Picture: Chris Hyde/Getty Images. THE cardiac kids have done it again. 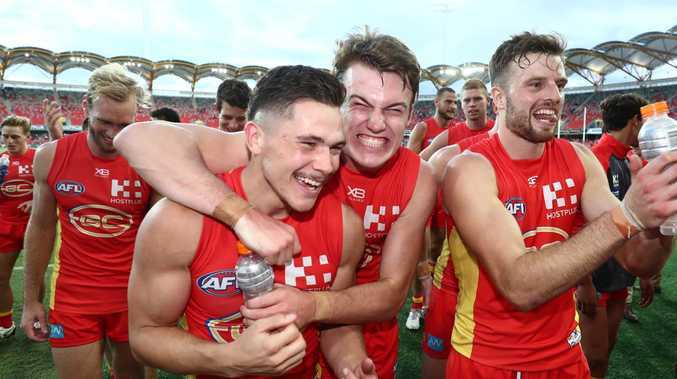 A Jack Bowes snap with 13 seconds on the clock handed Gold Coast a two-point victory over winless Carlton in front of 14,176 fans who had spent the final quarter on the edge of their seats at Metricon Stadium. The 8.11 (59) to 8.9 (57) result means the Suns have now lost a game by a point and won the following three by three, five and two points. It also means the Suns and Lions are in the top eight together for the first time. Relieved coach Stuart Dew said both clubs could take a lot out of the game and admitted luck may have played a part in who got the points. "It was that kind of day where both clubs sit back and take a breath,'' he said. The Blues winless streak now stretches back to their last visit here in round 19 when they stunned a Suns outfit coming off the best win in club history over Sydney. As a spectacle that day was about as bad as footy gets and on the skills front yesterday wasn't much better. Dale Thomas reacts after Jack Bowes’ goal late in the last quarter. Picture: AAP Image/Dave Hunt. Although it was a pleasure to watch Carlton's No. 1 draft pick Sam Walsh at work while Patrick Cripps and Touk Miller waged a battle for best on ground honours in the midfield. The difference from this match and the last was the intensity especially in the final moments. 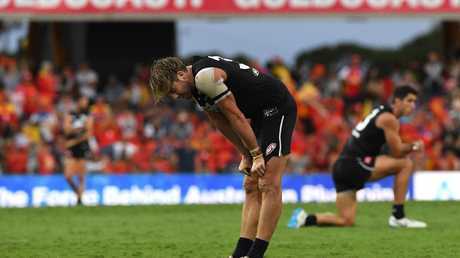 For much of the second half it appeared Gold Coast's troubles with expectation had resurfaced and they were about to once again provided a circuit breaker the embattled Blues desperately needed. Their coach Brendon Bolton's job was said to be on the line when he came up here and won last year and the same sentiment appeared in media reports this week. It was a game devoid of highlights but veteran Blue Dale Thomas provided one midway through the final quarter when he wound back the clock to take a flying one handed mark on the shoulders of Peter Wright. Jack Bowes celebrates his late matchwinner for Gold Coast. Picture: Chris Hyde/Getty Images. It summed up Wright's day. He kicked a beautiful goal from the boundary line in the opening quarter to showcase his immense talent but was rarely spotted again until Thomas used him as a stepladder. 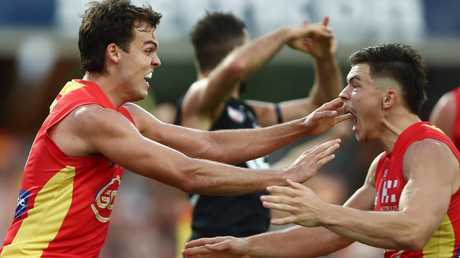 With just over seven minutes to play and the Suns holding a one-point lead, Wright attempted to mark a long range Alex Sexton shot at goal when the correct play would have been to shepherd it through. He fumbled it over the line and less than twenty seconds later Patrick Cripps took a contested mark at the other end of the ground and converted to out the Blues in front. The Blues hung doggedly to that lead as Gold Coast sent a barrage of footy inside their attacking fifty only to be repelled. Liam Jones and Jacob Weitering played huge games. There were mistakes galore as the pressure mounted until Bowes pounced on a loose ball after a ball-up and sent a left foot snap over his shoulder from 15m out. "Bowesy joked about snapping one on is left in the warm up actually when we were mucking around in the rooms,'' he said. The Suns were a man down for over half the game after wingman Wil Powell was concussed when his head was slammed into the turf by Blue Will Setterfield in the 23rd minute of the second quarter. The action did not draw a free kick from the umpires but is certain to be reviewed by match review officer Michael Christian. THAT was a tick for the Suns midfield. Patrick Cripps is probably the best midfielder in the competition at the moment and is supported by a cast of top ten draft picks. But Touk Miller, David Swallow, Jack Bowes and Brayden Fiorini won the day. WILL Setterfield is in trouble. The umpire missed a blatant free kick when Setterfield slammed Wil Powell face first into the turf in the 23rd minute mark of the second quarter but it is doubtful the MRO will. Gold Coast's medical staff and his team mates could have handled things better too. Everyone at the ground could see Powell was in trouble but inexplicably he was left to try to get to his feet unassisted. The sight of him staggering around and eventually falling over was terrible and should never have happened given it occurred almost directly in front of the Suns bench. SAM Day needs to come back into the Suns' side. The Suns had more inside fifty entries than their opponents but tall forwards Peter Wright and Chris Burgess were completely ineffective. They weren't even able to consistently bring the ball to ground to give their small forwards a go as Blues defenders Liam Jones and Jacob Weitering ran riot. PLAYERS develop differently and it is especially noticeable between midfielders and those who occupy key positions. Suns fans have to be mindful of that. Carlton's number one draft pick Sam Walsh is already making his mark on the competition while the next name called, Jack Lukosius, has a lot of developing to do. The good news is he has shown in early signs he is going to be a good player. PETER Wright had a tough day. It was debatable whether he should have attempted to shepherd a long range Alex Sexton shot at goal or gone for the mark. Dew backed him in that going for the mark was the right option. In that case he should have taken it.